Not the most imaginative offering, but the month’s half over already. I’m afraid if I don’t put something up now I’ll forget until it’s too late and break my perfect record. The featured photo is just your normal roadside directional sign. It’s perhaps a bit more interesting than most because it’s from Istria, where the … Continue reading "A sign for September"
I can’t believe it’s taken me so long, but I finally got around to taking a phot that includes both water and a bicycle in it. Just in the nick of time too, since the month’s all but over. 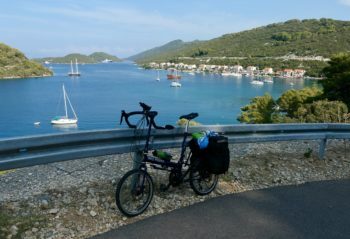 The featured photo is taken on the island of Mljet, Croatia – a beautiful, parklike island … Continue reading "Rising to the challenge at last"
I’m enjoying being back in Portland for about two weeks, usually starting the days out slowly by checking in at one of my favorite coffee haunts that I can only make it to once or twice a year now. This morning I’m in Ristretto Roasters, enjoying a mustard and cheese croissant and surreptitiously glancing at … Continue reading "In Korcula"